It all began from a facebook invite. It was literally saying "Mozzarella di bufala Campana from Naples arrival to Moscow, Domodedovo airport, April 25, 6.30 am". A bit later I got a message from Sergey Ignatuk, who I recently got to know on facebook. Sergey managed to import some amount of Mozzarella di Bufala Campana from Caseificio Antico Casale, a product he is passionate about. He asked whether I was interested in trying it and sharing my opinion. Well, what could I say? Of course I was interested, though I have no expertise regarding Italian cheeses. 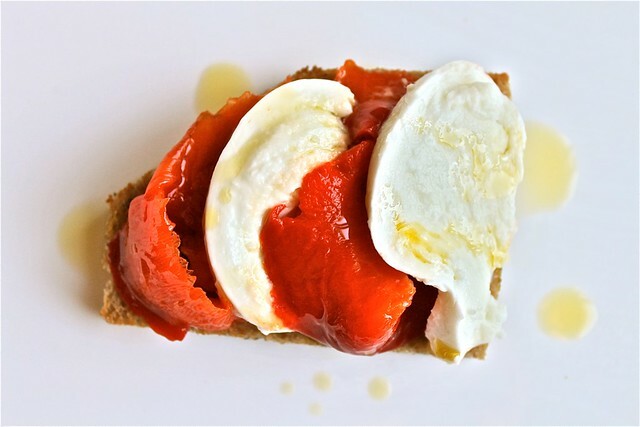 I tried buffalo mozzarella couple of times while on trips to Italy, but never tried mozzarella produced in Campania and controlled by origin. The next day Sergey arrived. He brought two little bags, one with the mozzarella and the second one with a glass bottle of olive oil. It was Kalamata extra virgin olive oil from George Nikiteas and Sergey also brought it to try. I had a chance to briefly ask about the story behind and Sergey told me that both products are produced or distributed by his personal connections. Some time ago they tried to import to Russia themselves but it didn't work out because of heavy customs procedures and consumer tastes still in development (which is easy to believe). However now Sergey's attempts are growing more successful and he finds more and more people in Moscow who really appreciate these products. I enjoyed talking to Sergey. He's got lots of positive energy coming with the strong passion to do what he is doing. He found me thanks to Pinch of Cinnamon classes and let me try them, for which I'm very grateful. First I opened the oil (please note that in olive oil I'm no expert either). The color was very intense, more on the green than yellow side. The aroma and taste first made me think not about oil but about olives themselves. It somehow instantly reminded about that reach taste of large black olives you get either in Greece or in Italy. 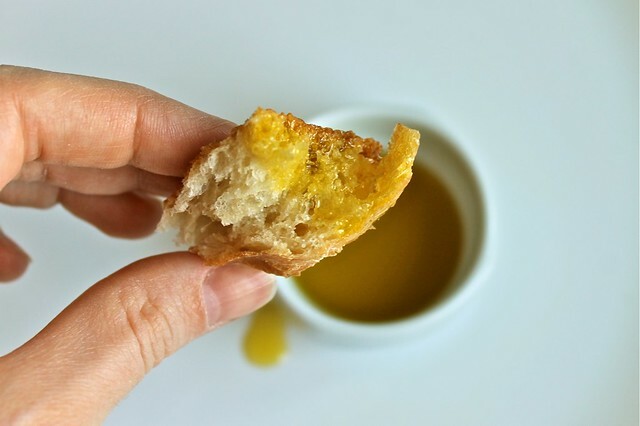 Just the oil with a piece of nice bread and a tiny bit of salt felt good enough. Nothing else was needed. Then I turned to mozzarella. It was really pretty, but I still decided to cut into. The taste was more intense milky and more salty (a bit like sea water) than what I'm used to. Just to make it clear, what I'm used to is cow's milk mozzarella of either Galbani or Castelli, which is most easily available in Moscow. When I cut closer to the middle I realized there was more to discover. While the outside of the ball was quite firm and fibrous, the middle was creamy, almost melting. The cheese was irresistible and didn't need anything to go with it. Some time after I returned to thinking about what I would serve this mozzarella with, if anything, to present it it its really best light. 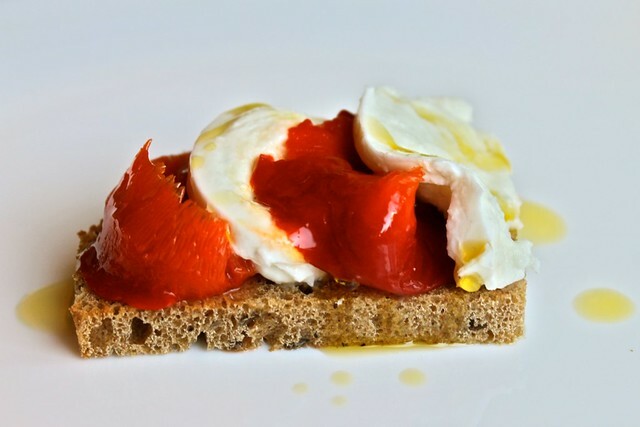 Thus I arrived to this sourdough bread bruschetta with roast sweet pepper. I made it for breakfast and that was honestly the best bruschetta I ever had. Heat the oven to 240C. Place the whole pepper on a baking sheet covered with foil (no oil needed) and roast it for 35-40 minutes, till it softens and the skin starts to turn brown. Remove from the oven, wrap the pepper into the foil and leave for 15-20 minutes to cool. Unwrap the pepper, remove the skin and the stem make sure to keep all the delicious juice, which will gather inside the pepper. Remove the seeds and membranes. Thinly slice the flash and place it into the juice to prevent it from drying. Gently slice the mozzarella around 5 mm thick. Toast the bread on both sides. You can use ordinary toaster or dry frying pan or 200C oven (the bread will need around 2 minutes a side). It should get a little crispy on the outside and remain soft inside. Place the bread on a serving dish. Very slightly rub it with garlic. Drizzle with a bit of olive oil. Arrange the slices of pepper and mozzarella on top. Add more olive oil, a bit of salt and serve. To a classic bruschetta one would add some freshly ground black pepper, but here I wanted nothing sharp to interfere with mozzarella. 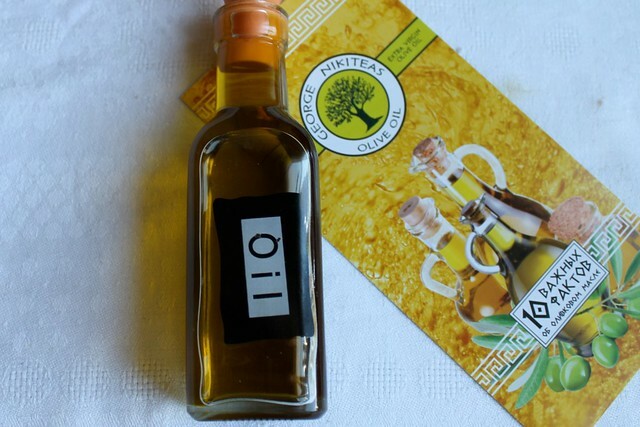 Kalamata produces great olive oil and olives, Crete as well and maybe you can try from Lesvos too (Mytilene olive oil). In my opinion try to avoid any olive oil that isn't produced in Greece or Italy, as other countries produces huge quantities using Greek or Italian olive oil in a small amount and low quality other olive oils.